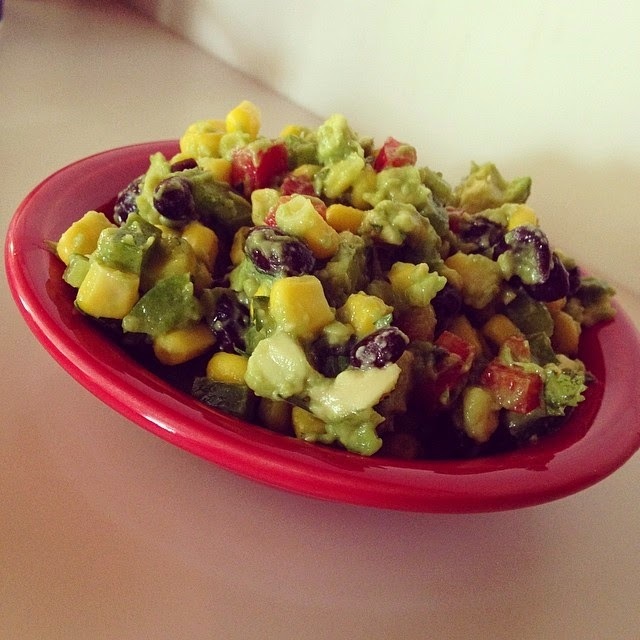 I absolutely love the freshness of CPK's Corn Guacamole but CPK is kind of stingy with it! The "small plate" is exactly how it should be described, small. I feel like once I start eating it, it's never enough! I also feel like it is hit or miss. Sometimes it is mostly corn and just a small amount of avocado as the glue to hold it all together. Other times, there is a little bit more avocado, but it's still not enough for me. You all know I love avocado, so the more, the better! I decided to try my hand at the recipe when I found myself with four small avocados that were a tiny bit too ripe, but I wasn't going to let them go to waste. CPK uses a white corn, but all I had on hand was yellow, so that's what I used. When it is in season, I recommend fresh corn off the cobb, but if you can't get that, use a low sodium or sea salt can of corn or frozen. To crisp my corn up a little bit, I sautéed it with about two teaspoons of butter and it turned out delicious! CPK has jicama in their recipe to add a little sweetness and crunch, but I have two things going against me when it comes to needing an ingredient like jicama. Number 1. I shop at the commissary. The produce is hit or miss. One week we have something, and for the next couple of weeks, it's like it was never there. Number 2. I'm in Hawaii. No explanation needed. If you can find jicama easily, add a 3/4c in a small dice. Everything in this recipe is a small dice, that way you can get all ingredients in one small bite! When I say small dice, try to keep it about the size of a kernel of corn or smaller. Hope you enjoy!!! We ate our entire bowl in less than 24 hours!!! Combine everything except the Avocados. Once everything is mixed, add the avocados and enjoy with tortilla chips!! !